The 4200 meters of the Grand Combin glacier, on the border between Switzerland and Italy, marked the start of the race against time to secure the 'memory' of the Italian Alpine and Apennine glaciers, the European ice most threatened by climate change. The survey organized by the glaciologists of Ca' Foscari University of Venice and the National Research Council will indicate at which point along the glacier it will be possible to extract, in an upcoming expedition, the deepest ice cores, providing centuries of historical climate data. The surveys carried out with georadar will allow a three-dimensional reconstruction of the rocky substratum hidden by the ice, while a sampling of 12 meters will soon be analyzed at the laboratories in Venice to better prepare for the actual expedition. 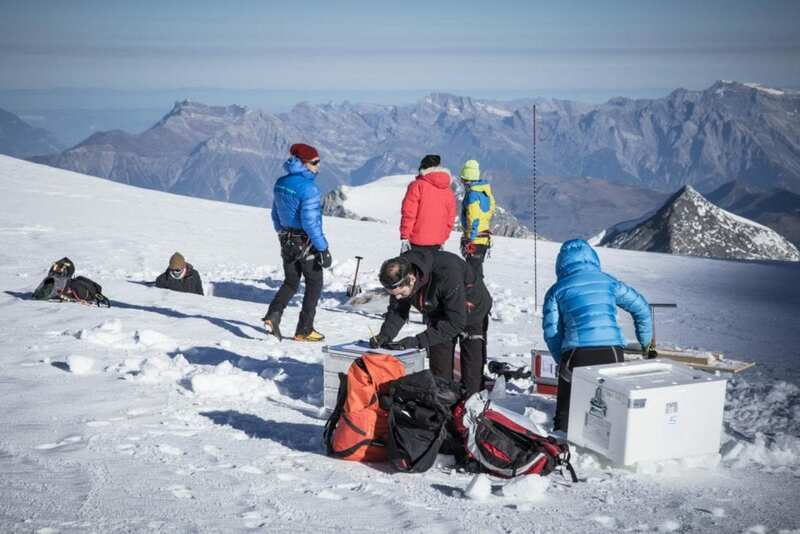 Thus begins the Italian 'chapter' of Ice Memory, an international project under the patronage of the Unesco national commissions of France and Italy, which involves glaciologists from various countries, including the French co-organisers of the project. The main goal is to create in Antarctica, the land of science and peace, the world's first 'ice sanctuary' for ice cores coming from glaciers threatened by global warming. These samples will form part a global human heritage under an international governance that will ensure their conservation as well as appropriate and specialised use, so as to allow future generations of scientists to carry out unprecedented analyses. The first samples were taken by the international team on Mont Blanc and the Illimani glacier in Bolivia. The Italian team is now organizing expeditions to glaciers destined to disappear in the coming decades. The list includes the Colle Gniffetti (Monte Rosa), the last major glacier in the Dolomites (Marmolada); the lowest-altitude glacier in the Alps (Montasio, in Friuli, about 1900 meters above sea level); and the southernmost glacier in Europe (Calderone, in Abruzzo). The Italian mission has obtained a grant of 920,000 Euro from the Italian Ministry of Education, University and Research. Coordinated by the Université Grenoble Alpes Foundation, the project brings together CNRS, French National Research Institute for Sustainable Development (IRD-France), Université Grenoble Alpes, the National Research Council, Ca' Foscari University of Venice, the French Polar Institute (Ipev), and the National Program for Research in Antarctica (Pnra) as regards the activity at the Concordia station in Antarctica.